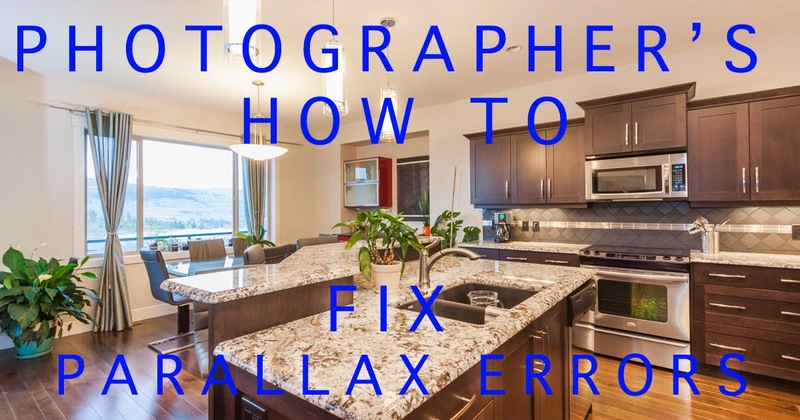 So, this is a post designed mostly for the photographers with a problem that is very easy to struggle with when you are starting with real estate, interior, or architecture photography. And for everyone who is not a photographer, this post could serve as some insight to why you should hire and trust experienced professionals to create your images. So What am I talking about? Parallax errors or converging vertical lines. 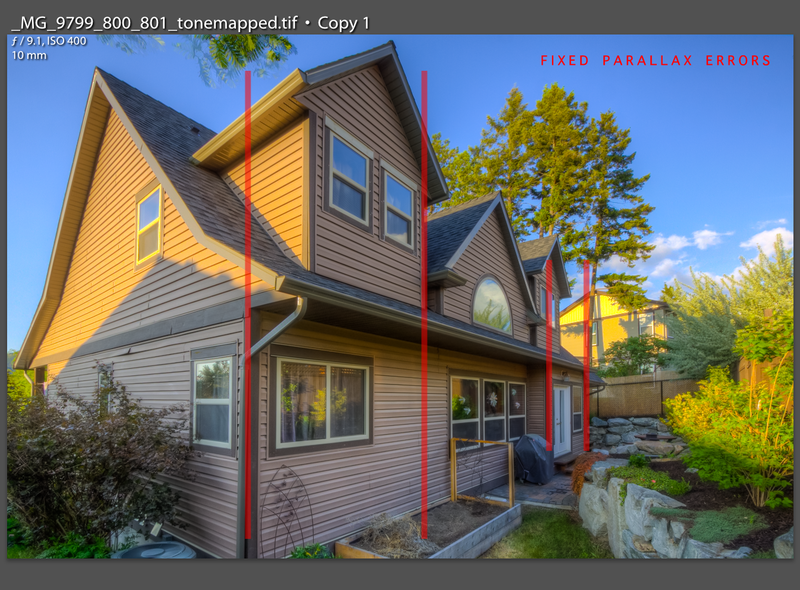 So the good thing about correcting parallax errors, unlike lets say, lighting in a real estate image, is that it will work just as well with JPEGs as RAWs. 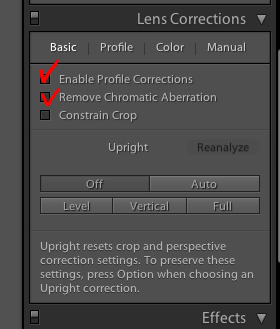 There are various programs to fix parallax errors, but the one I use, and that is most easily and efficiently integrated into my workflow, is dealing with Lightroom 5. 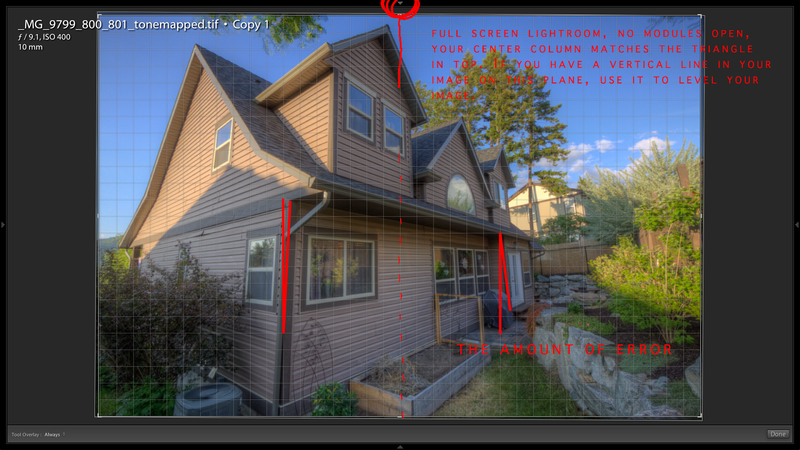 I believe LR 4 and maybe 3 had this ability as well - found in the manual lens correction area of develop module. I always aim to take the least distorted image on a interior photoshoot, but seemingly, no matter how close to perfect you get it in camera, its often off by a portion of a degree when its full screen on your computer, even with digital levels integrated to your camera back display. 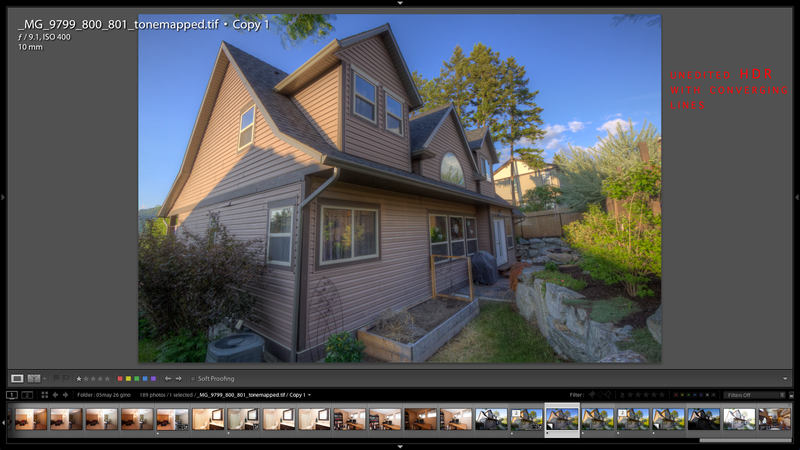 Once the images make it into lightroom, the lens correction is often like a recipe. 1. Rotate the image to be level first. I find the proper level of an image by using the vertical line closest to the centre of the uncropped image. Focus on making this line vertical first. I start off with the classic and original crop and rotate tool if I was wayyyy off, and then use the increments of rotation in the lens correction module for fine tuning. 3. The next few steps are like balancing a glidecam, or balancing colour in FCPX, a lot of back and forth until its just right. 4. Majority of what we deal with is in the Vertical Adjustment slider. Because we levelled our photo in the centre, this vertical line should never change or fall out of balance. All that remains is moving the vertical slider incrementally until vertical lines located on the left and right hand sides of the frames are both pointing straight up. 5. Its important to note that you will be cutting data off from the top or bottom of your original frame if you didn't compose properly in the first place. Thats why its important to get as close to perfect in camera first, so you use as much of your original data as possible. a) Try shooting pointing at a corner from the opposite corner of the room or space. This is not only a great way to expand the size of the room, but it also guarantees you have a perfect vertical line in the middle of your image. This is great for your first step in post. A corrected image, note all the red lines are parallel to each other, and travel straight up and down. b) Have your camera sitting level on front-to-back and left-to-right axes. 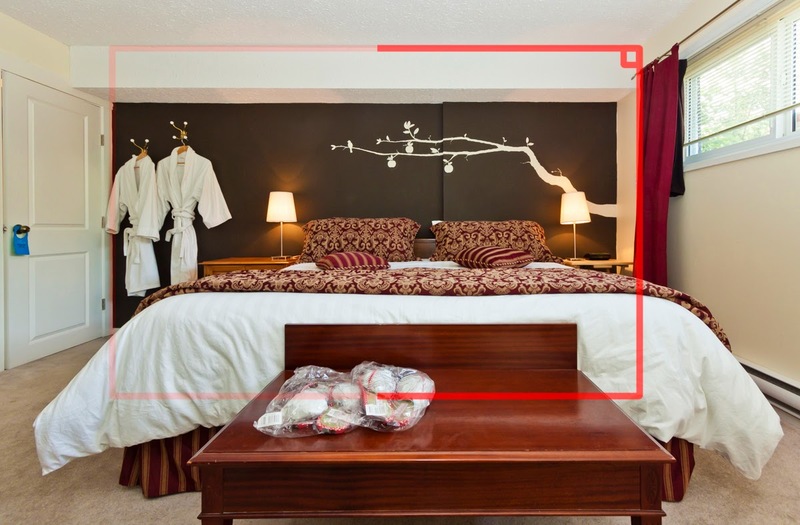 When capturing most images for real estate, that is - showcasing rooms as a whole, you should be able to not touch your ball head for the duration of the shoot, and simply manipulate the height of your tripod to suit the foreground of each scene. c) Use ultra-wide angle lenses. 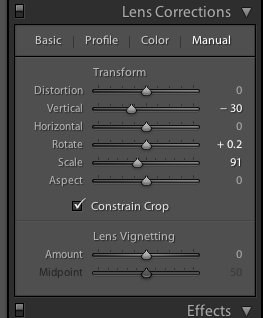 The lens I use currently on my cropped sensor body for real estate is the Canon EF-S 10-22 f/3.5-5.6 So it performs like a 16mm on a full frame. This is a good lens because it is an ultra wide, so it introduces minimal barrel distortion. 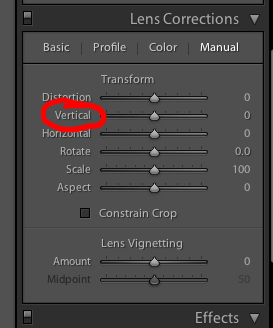 If you do use a lens that integrates barrel distortion, you will just have to use Lightroom's 'distortion' slider, as well as likely the 'scale' slider in the lens correction module. 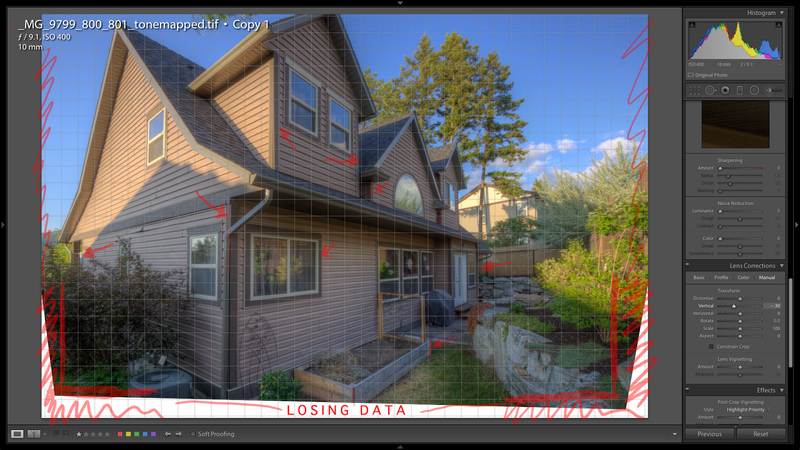 Just note, that with almost every increment of slide you make in the lens correction module, you are cutting data out of some portion of your frame. d) So there won't always be cases where you can fix a problem. What if someone has an amazing stairway in their home and you want to shoot up it, down it, showcase it, who knows what - you can't keep your camera level on two axes and face uphill at same time. So this is not a golden rule, just something to keep in mind when showing an interior as if you wanted to transport the viewer there and experience what it might be like to stay or live there in an accurate way. e) It will also come to a time when you don't want to face the corner every photo, and thats fine too. When I face perpendicular to a wall, it just involves the introduction of the 'horizontal' lens distortion correction slider. In my own work, when I face perpendicular to a wall, I like to make sure I am in the geometric centre of the wall if it is a shot one, if its a big wall, I just make sure I face it at 90 degrees. This will help make sure that your lines where your ceiling meets walls with travel across the frame horizontally. An example of this is shown in the next photo. Also note, that a lot of times, you may be inclined to shoot a room one way, but furniture will look extremely out of place from this angle. Keep in mind, often what feels most comfortable, and liveable in real life, isn't the best presentation for your photos. If you have the option to move some stuff around when the shot needs it, it will pay off. So, I wrote this tutorial first, and then started looking through for images with parallax errors, and to be honest, when you employ the steps I outline, you won't find many remain in your portfolio. I had to use an outside one to show what I consider a big error. Its hard to shoot a house from outdoors, and show the whole thing, without looking up towards the sky. Bring a ladder to shoots with big spaces, will help you get the middle of your subject into the middle of your level frame. I hope these tips helped you. Please let me know what you think in the comments below!